Multi Lock Pro is a medium-solids, latex-based adhesive with good bond strength and rebond characteristics. 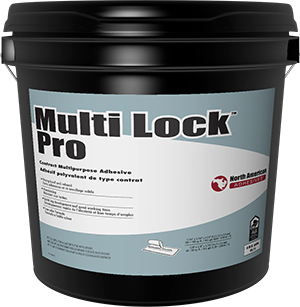 Multi Lock Pro dries to a flexible, rubbery bond line with good tack. Light in color, Multi Lock Pro is a good choice for the installation of basic carpet types and felt-backed vinyl sheet flooring in residential and light commercial applications. Multi Lock Pro is ideally suited for flooring installations that may need removal within 2 to 3 years, such as installations in rental properties as well as main-street commercial and retail outlets. Multi Lock Plus is a medium-solid, latex-based flooring adhesive with excellent bond and aging characteristics. 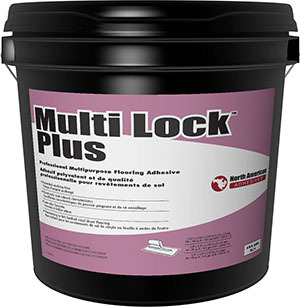 Multi Lock Plus will provide a tough, rubbery bond line that has superior tack and outstanding rebond characteristics. Its formulation has been specifically crafted to provide ample working time for carpets with patterns as well as for the positioning of felt-backed vinyl sheet flooring. Multi Lock Super is a high-performing floor-covering adhesive that is specifically designed for hard-to-bond carpets as well as most felt-backed resilient floor coverings. Its high-solids formulation is great for use in the wet-lay installation method, so that no flash time is required. This high-tack adhesive grabs quickly, permits ample open time and provides an exceptionally strong permanent bond. 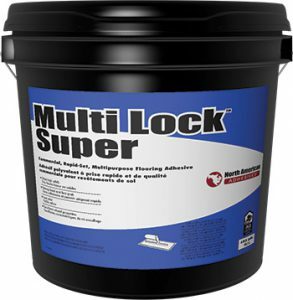 Multi Lock Super is perfectly suited for use in high-commercial traffic conditions. Carpet Lock Pro is a medium-solids, latex-based, contract carpet adhesive that is designed for the installation of most carpet types and felt-backed vinyl sheet flooring. Carpet Lock Pro provides quick-grabbing performance and a tough final bond. Carpet Lock Pro is suitable to install carpet and felt-backed vinyl sheet flooring in medium-traffic commercial applications. 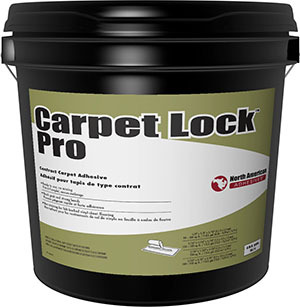 Carpet Lock Pro contains a small amount of solvent for faster performance and enhanced bonding characteristics. Carpet Lock Plus commercial-grade multipurpose adhesive is a superior-performing floor-covering adhesive, specifically designed for hard-to-bond synthetic carpet backings such as latex unitary and Actionbac ®, as well as most felt-backed resilient floor coverings. This high-tack adhesive grabs quickly, permits ample open time and provides an exceptionally strong permanent bond. 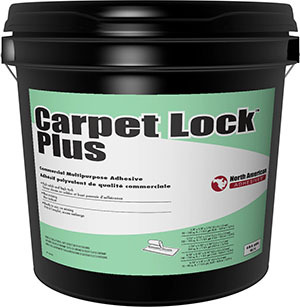 Carpet Lock Plus contains a small amount of solvent for faster performance and enhanced bonding characteristics. Carpet Lock Super is a supreme commercial, high-performance, high-solids, floor-covering adhesive specifically designed for hard-to-bond carpet backings as well as most felt-backed resilient floor coverings. Carpet Lock Super is a very tacky adhesive that develops rapid early legs, grabs quickly and provides an exceptionally strong permanent bond. Carpet Lock Super contains a small amount of solvent for faster performance and enhanced bonding characteristics. VCT Bond Plus is a VOC-compliant, latex-resin adhesive that is specifically designed for the installation of vinyl composition tile (VCT) in primarily commercial and institutional applications. It flashes quickly and has a strong initial tack that remains tacky for up to 12 hours. VCT Bond Plus dries rapidly to a thin and semi-transparent film, allowing layout chalk lines to remain visible for easier installation. 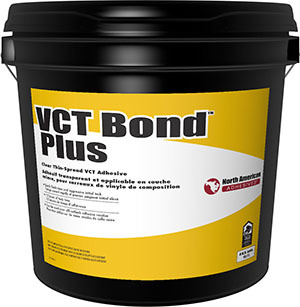 VCT Bond Plus contains a small addition of solvent to the formulation for faster performance and enhanced bonding characteristics. 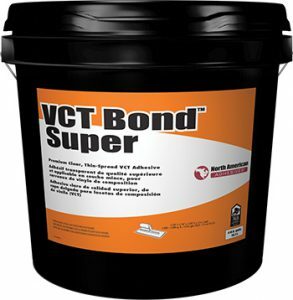 VCT Bond Super provides fast dry times, good grab and excellent slip resistance. Use it to install vinyl composition tile (VCT) on approved substrates as well as over an existing single layer of VCT. With good moisture resistance, it is suitable for use over fresh concrete slabs with moisture vapor emission rates (MVERs) up to 8 lbs. per 1,000 sq. ft. (3,63 kg per 92,9 m2) per 24 hours. Cove Bond is a commercial-grade wall-base adhesive with an acrylic base and light color that will not stain. 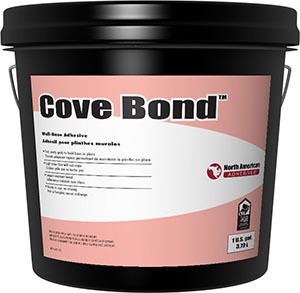 Cove Bond offers a superior bond and impact resistance for rubber, vinyl and carpet wall base. Greater grab and wet strength keep corners wrapped tight. Cove Bond can also be used to install various types of carpet in vertical/wall applications. 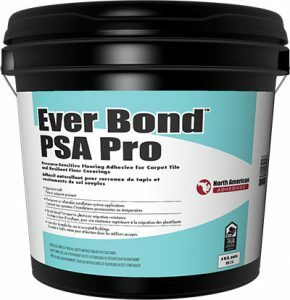 Ever Bond PSA Plus is a high-performance, wet-lay and “transforming” pressure-sensitive adhesive that is designed specifically for installing homogeneous and heterogeneous solid vinyl flooring. With its strong, durable, moisture-resistant and alkali-resistant bond, it is ideal for commercial and institutional applications. 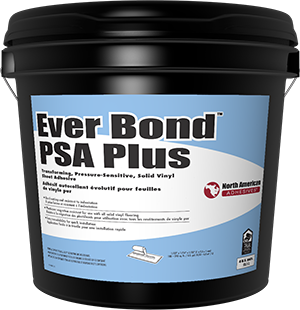 Ever Bond PSA Plus has an excellent open time, develops strength quickly, performs well under rolling loads and resists indentation. After the working time is over and as the tackiness of the product starts to dissipate, the shear strength and bond strength will start to increase. This “transforming” change happens slowly and bond strength continues to climb slowly even weeks after the initial installation. Ever Bond PSA Plus’s low volatile organic content and low odor make it ideal for use in occupied buildings such as hospitals and medical centers. Ever Bond PSA Super is an extremely aggressive, pressure-sensitive adhesive that is designed for the installation of a wide variety of flooring types, including engineered wood flooring, resilient flooring and carpet tile. 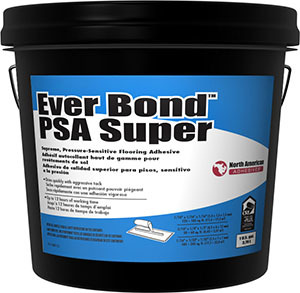 Ever Bond PSA Super has been specifically formulated to provide extended working time and can be applied using a trowel or roller, depending on the level of tack required for the flooring being installed. The product has low odor, low VOCs, has met the requirements for indoor air quality under the Carpet and Rug Institute’s Green Label Plus program, and can also contribute to LEED credits.